Elder Gerrit Walter Gong knows the power of prayer and that Heavenly Father has a plan for His children. When Elder Gong was young, his mother was once seriously ill. He remembers praying “in little-boy words and feelings” that she would live. Elder Gong has since experienced that tender communication with a loving Father repeatedly; including he says, in marrying his wife, raising a family, making educational and career decisions, and serving in the Church. Before his call to the First Quorum of the Seventy, Elder Gong served as a high councilor, high priests group leader, counselor in a stake Sunday School presidency, seminary teacher, bishop, stake mission president, stake president, and Area Seventy. 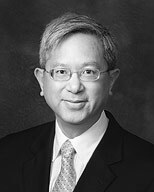 Professionally, Elder Gong has served as Special Assistant to the Under Secretary of State at the U.S. State Department and as Special Assistant to the U.S. Ambassador in Beijing, China. He also held positions at the Center for Strategic and International Studies (CSIS) in Washington, D.C., USA. At the time of his call, he was working as the Assistant to the President at Brigham Young University with responsibility for Planning and Assessment. Elder Gong was born to Walter and Jean Gong in December 1953 and was raised in Palo Alto, California. He received a bachelor’s degree from Brigham Young University in University and Asian Studies. He later earned a master’s degree and a PhD in international relations from Oxford University, where he was a Rhodes Scholar. He served in the Taiwan Mission and later married Susan Lindsay in the Salt Lake Temple in January 1980. The Gongs have four sons.